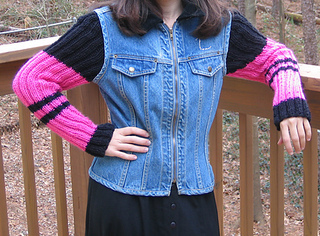 Ok so I have to be honest, this denim vest was knit up for a dear friend for a holiday gag gift. We both used to chuckle at the idea of having a denim vest with knitted sleeves so I decided to cheer her up I’d make her one of her very own for Christmas. I was too cheap to buy a pattern (given the fact that this was a gag gift) so I made my own. And no gag gift is complete without being done in the brightest of colors and without the recipients initial in sparkley diamonds. Truth be told that after I knit it up I decided that I actually (dare I say it) really liked it. So I share that pattern here with you - to be done in bright colors as a gag gift for a friend or in real colors to be worn with pride! Finished Measurements: Pattern to Fit a Women Size Small – but can be adjusted with one simple measurement.